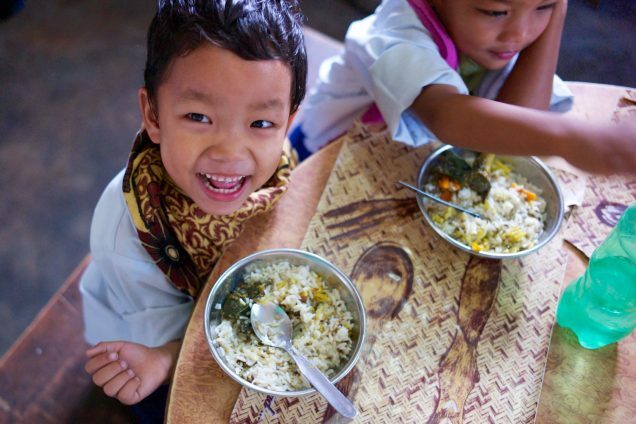 Photo: Orphans rescued from child labor and extreme poverty, now happy and enjoying daily fresh-cooked meals made from organic ingredients grown on our own farmland. In Nepal our native team is equipped with a farmland consisting of a goat house and terraced fields where they grow various vegetables, potatoes and herbs. The most recent crop they’ve experimented with is corn. Their recent 1000 lb. (450 kg) harvest of corn will not only feed the children but also the goats at the goat house, further improving the profitability of the operation. The farmland yields a consistent delivery of fresh, organic vegetables and herbs used in the cooking at our orphanage and human trafficking rehabilitation home. Although excess is sold in the market for profits, one of the primary benefits of the farmland is the nutritional value it adds to our orphans, staff members and other program participants’ diets. We believe strongly that part of a holistic recovery plan for these we’re caring for includes first and foremost their health, safety and mental well-being. The children at the orphanage, now numbering 25, love the home-cooked meals prepared by our Nepal director’s wife and her assistant. She lovingly prepares 3 meals a day, and can make the blandest vegetables come alive with her magic Nepali seasonings, to make any child crave more. Thanks to this empowerment model we employ, our native staff feels a healthy pride in their work, knowing that their labor is bringing health and joy to the “least of these.” We’ve been through many trials, successes and failures at the farmland, but ultimately we’re very happy with our current results. It’s by no means a huge profit-making operation, but it does put healthful, organic food on the plates of those we’re here to serve. In addition, the profits it does yield always come in at just the right time and allow for purchases like winter clothing, school supplies and other every-day needs that our general budget cannot always cover. Next:Uganda rural school experiences much success, and… a visit from the President!